June brings the MLB season almost to its midway point, and the Arizona Diamondbacks have seen their share of ups and downs already for the 2011 season. April was a real downer, and not the way a Diamondbacks fan would want the season to start. Then May saw the D-backs go on a couple different win streaks that put them in first place in the National League West Division. June was a month where it seemed like the Diamondbacks struggled to get through. June started with the final game of a series at home against the Florida Marlins. The Diamondbacks won that game, and then played another home series against the Washington Nationals. They split that series 2-2, and then headed to Pittsburgh to play the Pirates. They only won 1 of 3 in that series, and then went 3-1 against the Marlins in Florida. Back at home, they went 1-2 against the San Francisco Giants, and 1-2 against the Chicago White Sox. 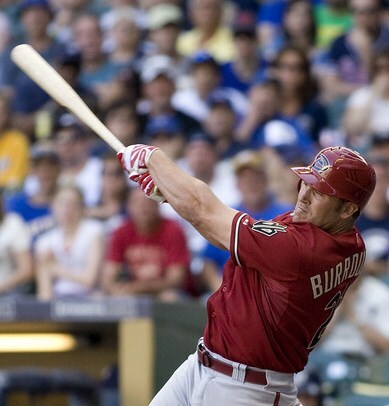 The Diamondbacks headed off to play the Kansas City Royals, and swept them 3-0. From there, they headed west to play the Detroit Tigers, and ended up 1-2 in that series. Back at home to end the month, the Diamondbacks played the Cleveland Indians and went 1-2 in that 3 game series. The Diamondbacks ended June with a 14-13 record, which gave them a 44-38 record for the year. The Diamondbacks had a 4 game win streak, but two 3 game losing streaks during the month. At home, they were 6-8. On the road, they had their second winning month in a row, going 8-5. Although they ended up with a winning record for the month, the Diamondbacks only won 2 of the 8 series they played against their opponents. Their magic number again for this month was 4. When they scored 4 or more runs, they were 10-5, and when they scored less than 4 runs they were 4-8. 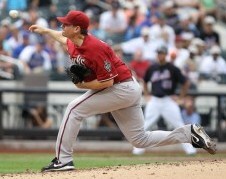 The Diamondbacks also had 3 shutouts in the month of June. The Diamondbacks as a team have been pretty consistent with their offense each month, but there have been some real individual differences. 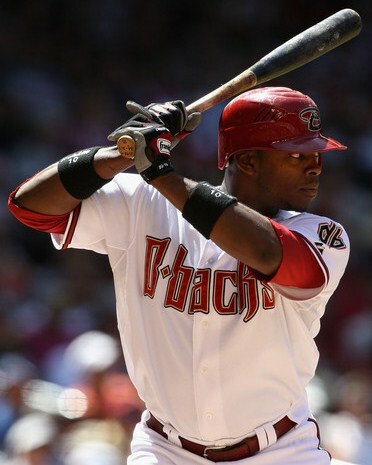 Justin Upton had a monster June, hitting .382 and bringing his season average up to .304. Gerardo Parra also had a good month, hitting .343 with 7 doubles and 3 triples. He brought his average on the season up from .263 to .288. The other player who had a good month offensively was Chris Young. He batted .300 in June and only struck out 16 times in 100 at bats, after striking out 25 times in April and 24 times in May. I find it interesting that these three players all had great offensive numbers in June, and they are all outfielders. Ryan Roberts, who started the season with a bang, has gone from a .313 average in April to a .218 June average. Unfortunately for the Diamondbacks, the more he has played, the lower his offensive production has become. First base has been a struggle offensively for the Diamondbacks as well. Both Xavier Nady and Juan Miranda have struggled as they platoon at first. Nady hit .218 in June, and Miranda hit .151. At second, Kelly Johnson has also struggled offensively. In June, he batted .176, and out of all starting second baseman in the major leagues this year, only Dan Uggla has a lower season average. Johnson also has 94 strikeouts through June, which is more than former Diamondback third baseman Mark Reynolds has this year in Baltimore. Although their team batting average is in the lower half of MLB and some individual players have had their offensive struggles, the Diamondbacks are still ranked within the top 5 in doubles, triples and slugging percentage. They are also in the top 10 in runs scored, home runs, and RBI’s. The Diamondbacks saw some ups and downs in their pitching for June as well. With that said, number one starter Ian Kennedy has been very consistent so far this season. He went 2-0 in 5 starts, and had a 2.68ERA. He is 8-2 in his 17 starts through June. Daniel Hudson had a great June with a 2.45ERA. His ERA has improved each month this year as his innings pitched have increased. In 6 starts, Hudson had a 3-0 record for June. Joe Saunders has also lowered his ERA each month, and for June he had a 2.91ERA. He has also lowered his opponents batting average while increasing the number of strikeouts each month. Unfortunately, Saunders only ended up 2-2 in his 5 starts for June. Josh Collmenter had a rough June after having such a great May. He had a 4.20ERA for June, and walked 9 batters in 30 innings after walking only 3 in 26 innings the month before. He started off with 2 good games, allowing 0 runs in 12 innings, but ended the month with 2 bad games, and one average game. In those 3 games he allowed 14 runs off of 23 hits in 18 innings. Collmenter ended 1-3 in his 5 June starts. Zach Duke had a rough June as well, after making his first start of the season May 28th and pitching 7 shutout innings. His 7.26ERA for June was worse than Armando Galarraga, who he replaced in the starting lineup. Duke only got out of the 5th inning once in his 6 starts. He allowed 25 runs on 55 hits in 31 innings pitched. Batters had a .390AVG against him, and he ended 0-3 in his 6 starts in June. Closer JJ Putz showed kinks in his armor as he only saved 5 of his 9 save opportunities om June, which were his first blown saves of the season. In 11 2/3 innings pitched, he allowed 8 runs on 13 hits, and posted a 6.17ERA. Putz had swelling in his arm and also noticed a drop in his velocity, and by July 1st, Putz was put on the 15 -day disabled list with tendonitis in his right elbow. This could be a big blow to the Diamondbacks staff if Putz cannot get back to his winning ways soon. June was truly an up and down month for the Diamondbacks as some players excelled while others struggled. Their record showed that struggle, going 14-13 for the month. The Diamondbacks also made some roster changes to try and help with some of the inconsistencies. On June 21st, they called up Wily Mo Pena from Triple-A Reno, after he was leading that league in home runs and slugging percentage. 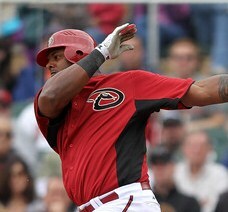 Pena has proven to be an all or nothing batter with the Diamondbacks. He hit 3 home runs in 9 games and only 26 at bats. His first home run in his first game tied the score, and his other two home runs were game winners. At the same time, Pena has struck out in 12 of those 26 at bats. The Diamondbacks also activated Sam Demel to temporarily fill Putz’s roster spot. They also released 39-year-old Melvin Mora after he hit .176 in June. Sean Burroughs was brought up from Triple-A Reno on May 18th, but was outrighted back to Reno on June 19th, after hitting .261 in 23 at bats for the Diamondbacks. With the release of Mora, Burroughs was brought back up from Triple-A Reno for the second time this season on July 1st. He was hitting .412 for the Aces at the time, and was on a 9 game hitting streak. The Diamondbacks came back down to earth in June, but their overall record stood at 44-38, and was good enough to place them in second place in the National League West division. They were only 2 games behind the division leader and current World Champion San Francisco Giants. If you take the Diamondbacks 44-38 record through June and extrapolate it out for 162 games, they will end up with an 87-75 record. I am still not sure if that would be enough to win the division, but it would be close enough for them to at least be in contention, and much better than last year’s last place finish. Management continues to tweak the roster to try and make improvements, which is good. I am just not sure the Diamondbacks have enough talent in their minor leagues to help them improve that much. June added more question marks for me as far as how good the Diamondbacks really are. Again, the lack of consistency is hurting the team, and may be the one thing that keeps them out of the playoffs this season. If they have another couple of months like June, look for them to drop out of contention all-together. ~ by Troy Erickson Realtor on July 14, 2011.